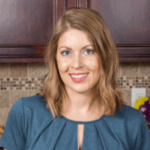 Published: Nov 23, 2015 · Modified: Sep 13, 2018 · By Jen Sobjack · This post may contain affiliate links. 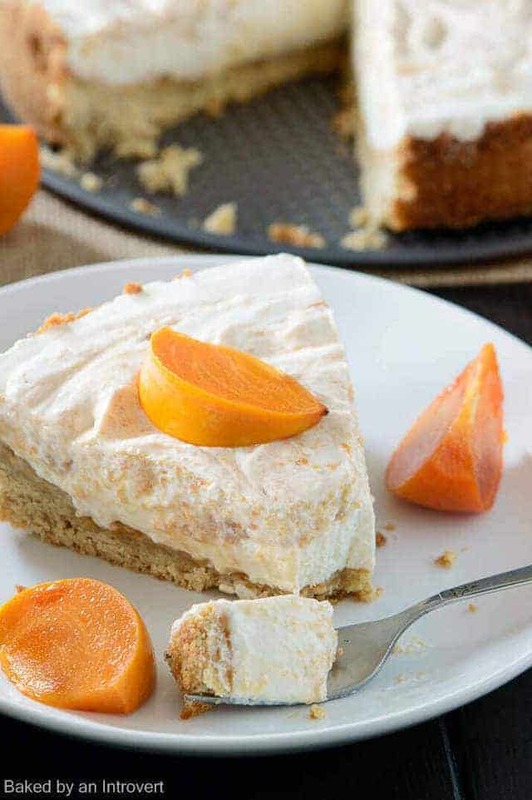 This Honey Yogurt Persimmon Tart is a deliciously light dessert! Fresh persimmon puree with hints of honey and brandy is swirled into a creamy whipped yogurt mousse and sits on top of a tender buttery crust. You won’t be able to stop yourself from going back for slice after slice! This tart is so light and creamy. It features the sweet and mild persimmon, which is now in season. The puree is made with persimmon, brandy, and honey. It’s cooked until the persimmons are tender and the liquid thickens before going into the blender. For this recipe, I used yogurt that is already flavored with honey and vanilla. If you can not find this flavor, you can substitute for just vanilla, add vanilla extract and honey to plain yogurt, or add honey to vanilla yogurt. I had my first persimmon 10 years ago. That means I was in my 20’s by the time I tasted this wonderful fruit. My husband is the one who introduced them to me. His family had a tree in their yard and every year they had an abundance of persimmons. Needless to say, I was eating a lot of persimmons during the fall. There are two types of persimmons. You have ones with flat bottoms, which are very firm. These are most often eaten raw. This is the variety I used for today’s tart. Then there are ones that look more oval in shape. These are super soft with an almost liquefied center. 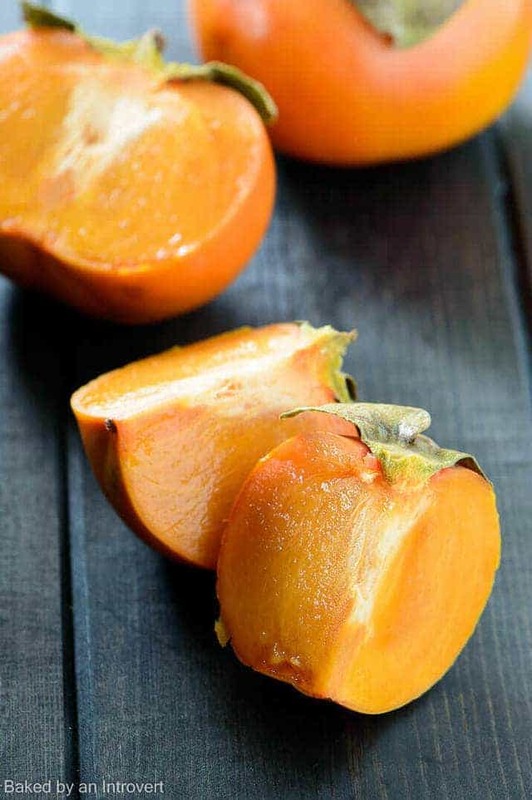 This type of persimmon is actually best for baking if you can find it. I have a hard time locating this variety which is why I chose to use the firm ones. I just cooked the persimmons down with brandy and honey to get them tender enough to puree. The filling for the tart is light and airy. Yogurt is folded into whipped topping and gelatin is added for stability. 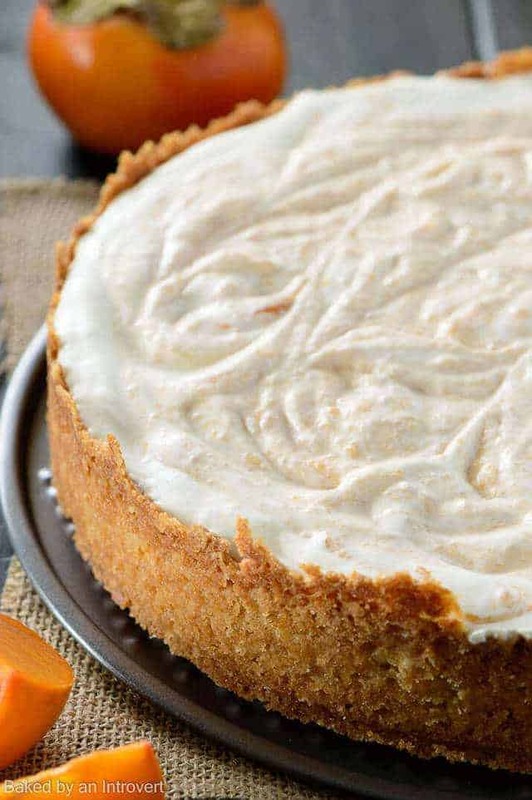 Half the pumpkin puree is spread over a buttery crust and the other half is swirled into the yogurt mousse. I adored the light, tangy flavor of filling. It doesn’t even need the crust! But, because we can’t call this a tart without the crust, I had to incorporate it. The crust is super buttery. I mean like leak out of the springform pan during baking buttery. Make sure you set the pan on a cookie sheet so the butter doesn’t seep to the bottom of the oven. The smell of burning butter isn’t pleasant. 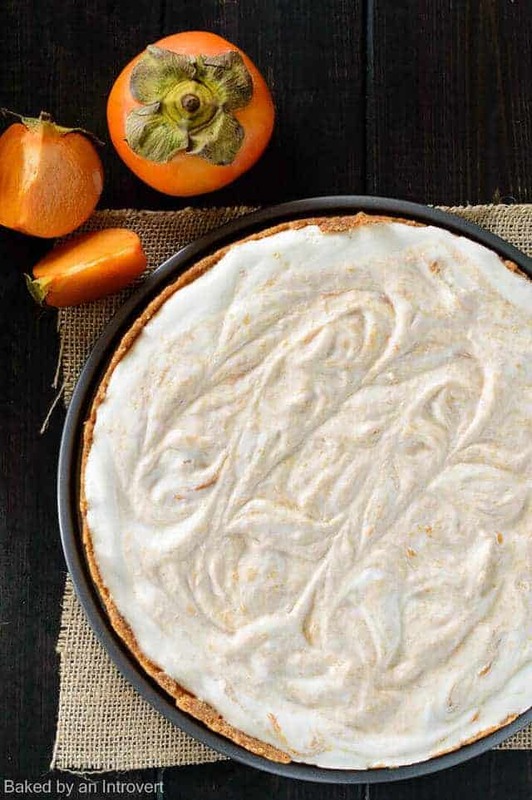 Grab your persimmons while they are in season and whip up this glorious Honey Yogurt Persimmon Tart! 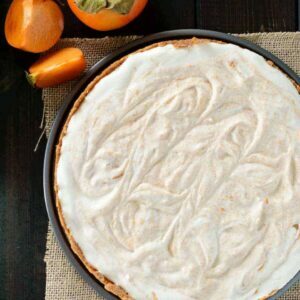 This Honey Yogurt Persimmon Tart is a deliciously light dessert! Fresh persimmon puree with hints of honey and brandy is swirled into a creamy whipped yogurt mousse and sits on top of a tender buttery crust. You won't be able to stop yourself from going back for slice after slice! Combine all the ingredients for the crust in a food processor. Pulse until the mixture comes together in large clumps. Transfer the dough to a 9-inch springform pan and press it gently with your fingertips onto the bottom and up the sides of the pan. Use a round measuring cup to firmly press the dough into a flat even layer. Cover and refrigerate for 1 hour. Meanwhile, make the puree. In a small saucepan, combine the persimmons, honey, and brandy. Bring to a boil over medium-high heat stirring occasionally. Reduce heat to medium and continue to cook for 10 minutes, or until the persimmons are soft and liquid had thickened. Carefully transfer to a blender and pulse the mixture into a puree. Scrape the puree into a small bowl and set aside to cool. Preheat the oven to 350ºF. Prick the bottom of the crust with a fork and line it with aluminum foil. Fill the crust with pie weights and bake for 20 minutes. Carefully remove the weights and foil. Bake the crust for an additional 20 minutes or until it is golden brown and dry. cool completely on a wire rack. In a small bowl, sprinkle the gelatin over 1 tablespoon of cold water. Stir well and set aside for 5 minutes until the gelatin softens. Heat 3 tablespoons of heavy cream in a medium microwave-safe bowl for 45 seconds. Stir in the softened gelatin until the mixture is smooth and free of clumps. Add the yogurt and whisk until smooth. In a large mixing bowl, beat the remaining heavy cream to soft peaks. Gently fold the yogurt mixture into the cream. Spread half of the persimmon puree evenly across the bottom of the cooled crust. Pour the yogurt filling over the top and smooth it to the edges with the back of a spoon. Drop small spoonfuls of the remaining puree over the top of the yogurt filling and use a butter knife to swirl it around. Cover and refrigerate for 4 hours. *If you can not find vanilla honey flavored Greek yogurt, you can substitute by adding vanilla extract and honey to plain yogurt or honey to vanilla yogurt. If I add the vanilla and honey to the yogurt. How much of each ? Just do it by taste. Add a little at a time until it tastes the way you like it. If I don’t have brandy can I substitute sherry or rum? Thanks. Rum would be a great substitute! Would port wine sub ok? I’m not really sure. I haven’t tried it. Can you tell me how many cups of persimmon does this recipe take? I didn’t measure the persimmon by cups. You need 5 persimmons for the recipe. Wow! What a gorgeous tart! 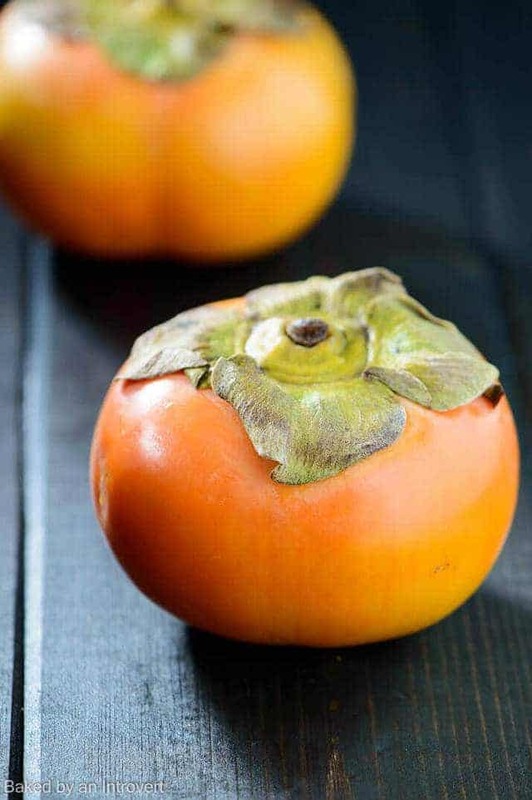 I’ve never cooked with persimmon before – I think I need to try! Thanks, Jessica! Persimmons are so much fun to bake with! Jen I have never baked with Persimmons ever but this tart really wants me to go buy some just so I can try!! This is one stunning tart,girl! Great tart Jen! I just got some persimmons and would love to try it! Pinned! Simmering in brandy and honey?! Wow! This flavor combination sounds incredible! My mom has a huge undying crush on persimmons and buys out whatever is in stock at the supermarket. I’ll have to make this tart for her. I’m sure your mom would be grateful. Enjoy! This sounds and looks amazing!! I have never baked with persimmons but absolutely love the color of them and think they would be so fun to photograph! I’ve never really used persimmons in my baking and cooking before. That needs to change with this tart! Gorgeous! I love persimmons, and I tried them first time ever almost 30 years ago (sounds horrible haha). Indeed, I haven’t used them a lot in desserts (just in ice cream and cookies), so this idea might be one I’m going to try! Anyways, persimmons, honey, and vanilla (needless to mention brandy) – such a delicious combo! I bet they are soooo good in ice cream! Thank you for giving me even more inspiration, Ben! Have a wonderful day! This tart looks gorgeous, Jen! I’ve never actually baked with persimmon before, so I definitely need to change that. What a creative dessert! Yes, you definitely need to change that! Okay, WOW. First of all, your photos are stunning! Love the shot of the persimmon on its own. So pretty! Thank you so much for the kind word, Blair! I can’t believe you have a persimmon tree. You should definitely find ways to bake with them. I promise you won’t be disappointed.